It all started when Kamek and Baby Bowser set out to steal a gem-set stone. Legend has it that this fabled artifact can grant the bearer their wildest dreams! But when the artifact's gems are sent flying, it falls upon Yoshi and friends to find them. Yoshi’s Crafted World is pretty close to what a Yoshi game would look like if Media Molecule made Nintendo games -- but, it’s missing the individual level creator that game probably would have. It’s the worlds design that made me think of the LittleBigPlanet developer though, as I made my way through levels made up of paper mache seagulls, pillars made from households supplies and a background that made me feel like I was in the most colourful Nintendo-based school diorama project. Good-Feel, the developers behind 2015’s Yoshi’s Woolly World return for another Yoshi adventure, but this time the world is somehow even more colorful, creative and one of the most wonderful things you’ll play in 2019 design-wise. If you thought Woolly World was this cute little adventure, you need to prepare yourself for the utterly endearing charm that Crafted World will hug you tightly with. Once again the pain that is Baby Bowser and his sidekick Kamek show up on Yoshi’s Island and attempt to steal an artifact that contains 5 gems. Amidst the botched heist the gems all go flying across the world and it’s up to one (or two if you play two-player) Yoshi’s to track them down and save the day. 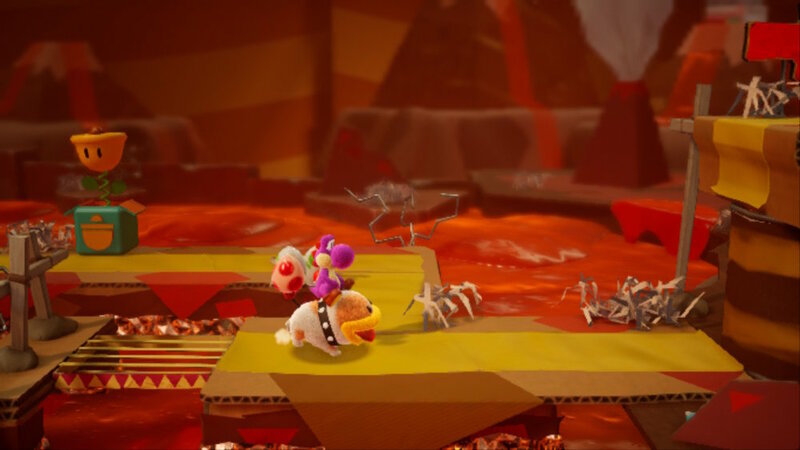 Yoshi’s Crafted World takes place on a 2.5D plane, meaning the side-scrolling platformer will at times have you move to the background and foreground to progress or in search of the many collectibles. You’re also able to shoot Yoshi’s eggs — which you get from eating enemies or from blocks that drop them out — off into those directions in search of stuff. The level design in Crafted World encourages you to explore things in the background and foreground as well and really, Yoshi’s Crafted World is an exploration game and that’s why its level design is so fun to explore and discover as well. It’s the artistic magic that makes progression in Yoshi’s Crafted World feel so fun and your reward for reaching a new world or level is often just seeing what’s been put together with some household items. 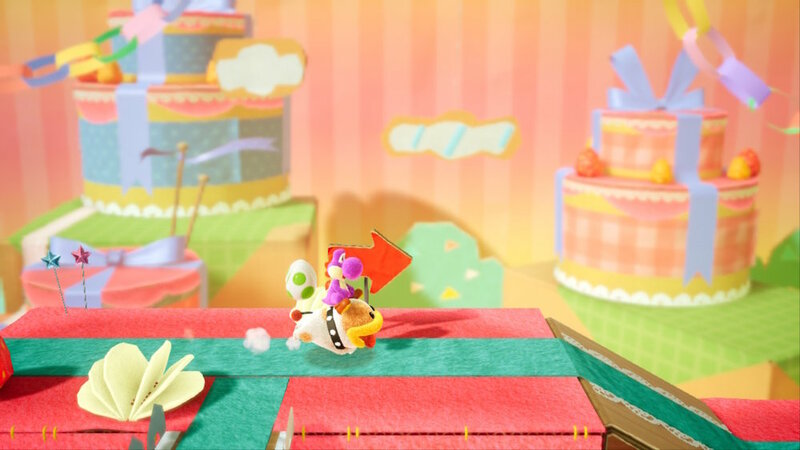 Although Yoshi’s Crafted World is obviously designed as a more relaxed and casual experience, the game does involve some combat and platforming. Even if the first couple worlds feature nearly nothing but shy-guys, which aren’t really threatening and just fodder to keep you filled with eggs, eventually enemies that hurt you come at a more frequent pace and the platforming sections increase in difficulty. In fact, in a wild swing of events, I was really surprised when one of the later levels feature an enemy type that can’t be taken out and just chases you across the entire level in a real horror movie vibe. Beware of that one, guardians and parents of younger kids. As is a Nintendo staple at this point, there is a mode you can activate called ‘Mellow Mode’ that will let you survive everything and have infinite flight if you're struggling. You can also increase your health by equipping various outfits which you get from vending machines in-game using gold coins. It all feels like an attack on loot-boxes, but I may read too far on this one. The costumes you get are all adorable however as Yoshi simply holds them around his body and runs along. There are several fun boss fights which aren’t too difficult -- I only failed once on the final boss -- but much like the rest of the game, the fun here is just getting to see it all come together as the bosses are formed from real objects in a somewhat stop-motion looking cut-scenes. As you play through each level you’ll be on the lookout for smiley flowers, gold coins and red coins. You need a certain amount of flowers to progress to the next world, but the number is usually around 10-15 which you should have unless you rushed through stages. It may be an annoying gate for those wishing to just speed through the levels as if it was Mario, but the game is asking you to explore, not rush and honestly, please appreciate this game’s wonderful design. A couple levels throw a spanner at you with score based challenges. One, for example, you run through the level attempting to hit as many beavers as you can in the background as the level forces you to constantly move as it moves forward. They offer a change of pace which was nice to have thrown in at times. Yoshi’s Crafted World has X+ levels, but lots more to do on top of that as the majority of those let you play through them backwards as the camera swings around to the other side of the world, and this time you’re on the look out for three Poochy Pups in hidden places and also trying to beat the level’s time. What makes the reverse levels so fun is the same magic that makes them a joy the first time. The levels feel brand new as you discover things you couldn’t see before from your new perspective. Finding funny little shy-guys hiding out inside of things you made your way over the first time gives you a real appreciation into the level design and art that went into each tiny detail on each level. My biggest issue with Yoshi’s Crafted World is its repetitive music which starts out great, but soon becomes a looping annoyance. Where there is so much variety and charm in each level, there is absolutely none of that to be found in the music department. Yoshi’s Crafted World sure doesn’t reinvent the wheel when it comes to adventure platformers like this, but it doesn’t need to when it brings this much joy, charm and cuties to your screen.